The sweetness of honeysuckle and mock orange floats in the moist air this showery summer evening. Swainson’s thrushes trill their spiralling song and hummingbirds buzz each other back and forth across the garden. It feels like a time to slow down, to lay down the to-do list, or at least to let the things that always fall to the bottom, rise closer to the top. For us this is a time of “putting our household in order,” which includes everything from weeding the front flower beds, to making appointments to see the dentist, to crunching numbers to see how much longer we have to work at our “day jobs,” to restoring our basement zendo, in hopes of once again inviting you out to sit with us here on Blue Mountain, between Maple Ridge and Mission. 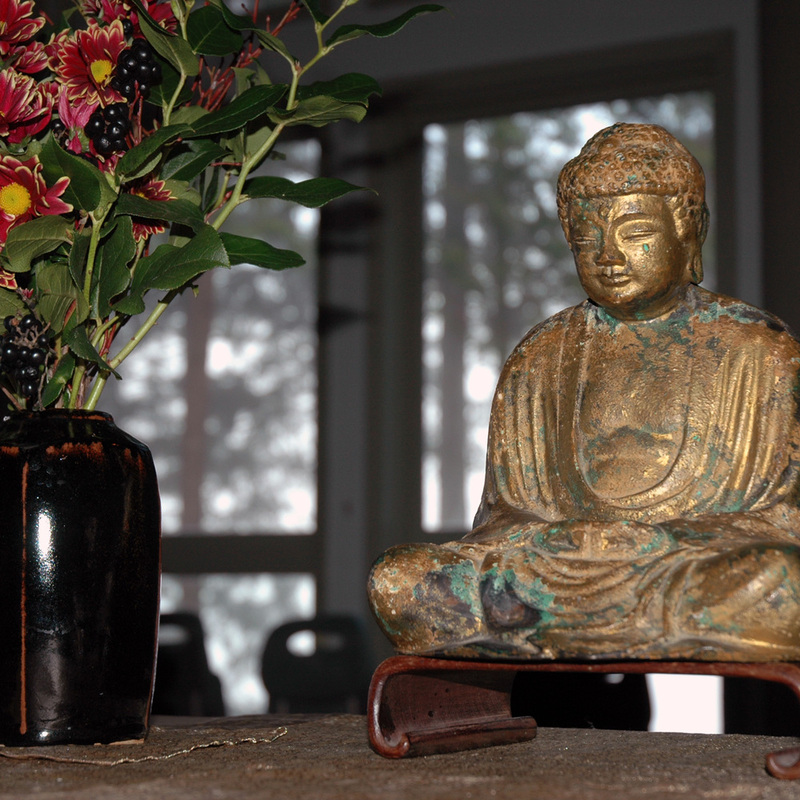 In May each of us spent a week at a rural Zen Center, Kate at Mountain Lamp Community in the foothills west of Mount Baker, for a week of Zen and poetry, and Michael at Great Vow Monastery in Oregon, overlooking the Columbia River, for a week of Tibetan Mahamudra practice. Several sangha friends from Mountain Rain and Red Cedar Communities have just left for three weeks at Upaya Zen Center in New Mexico practicing with Norman Fischer and Kaz Tanahashi. Maybe we can have a simple low budget summer practice period here next year… There’s something so nourishing about early-morning sitting with birdsong, working in the garden, taking time to read and write, and walking outdoors in the lush greenery at this time of year. We hope that you, too, will slow down this summer, and be alive in your body, senses open—and when you’re able, come to the zendo and sit together with ease and joy. However arbitrary and provisional our marking of time may be, and how subjective our experience of it—how it flies or drags, we do organize our society around the cycle of the year. It often seems to make more sense to celebrate the lunar New Year that falls closer to the turning of the season from winter to spring. But we do celebrate close to the winter solstice, which is often a time for reflection on darkness and light, birth and death, cycles and transformations. The end of one year and the beginning of the next seems to be a time when we reflect on our values and aspirations and whether we are living a life that is aligned with our deepest vows.